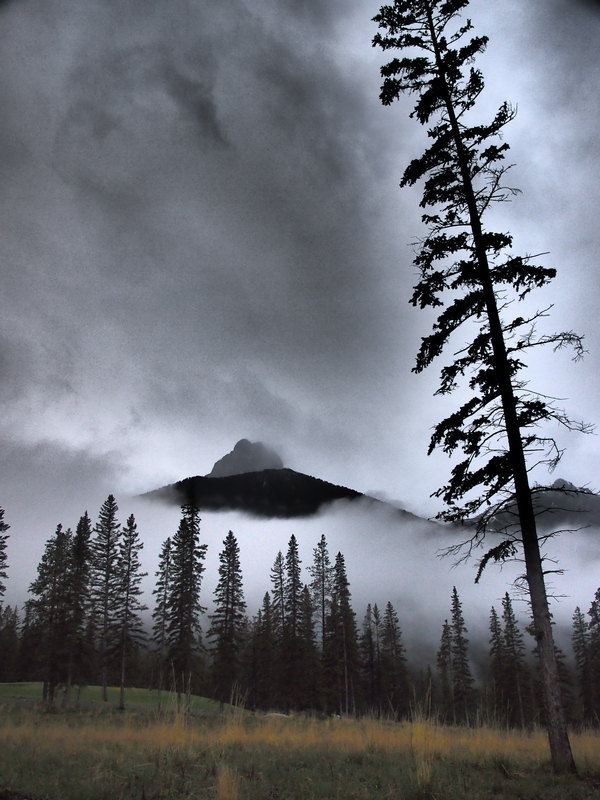 Banff, Canmore and Kananaskis Country were under a heavy rainfall warning most of last week. A flood watch was posted about mid-week, upgraded to a flood warning on Thursday. Fire crews were out building sandbag berms along sections of the Bow River most at risk of flooding. 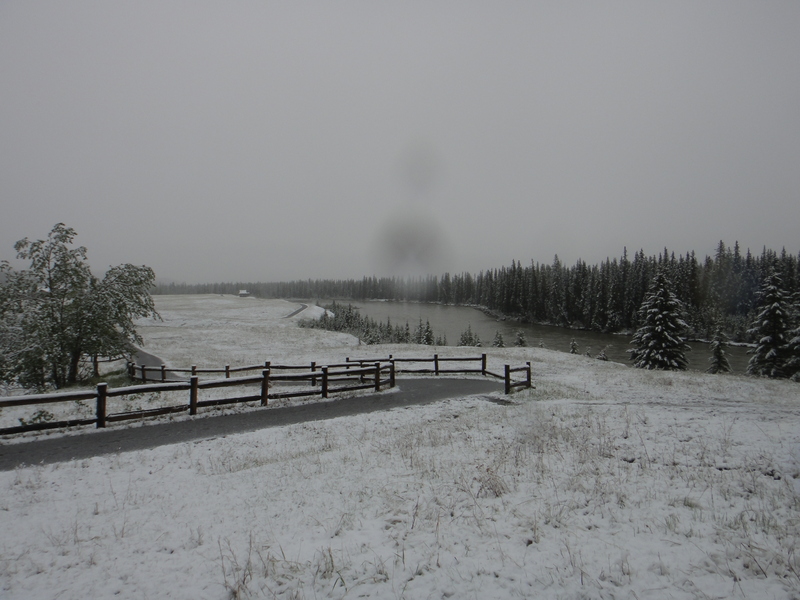 We headed to Canmore Friday afternoon, encountering extremely heavy rain throughout our drive. The water level in Lac des Arcs was higher than we’ve ever seen it. Canoe Cache, which we found by skating over to the little island a few winters ago, is probably long gone in the strong currents. 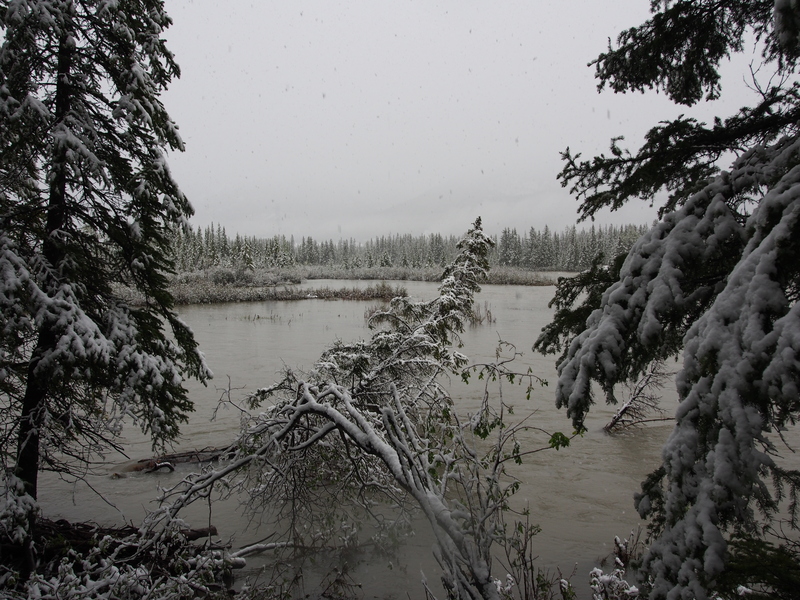 Continuing west, we saw water covering low-lying areas all the way into Canmore and in a couple of spots, the water was within a few meters of the shoulder. Friday evening it stopped raining for a bit. Mrs. GeoK went for a short walk and discovered all sorts of debris along the banks of Three Sisters Creek, one section where the creek was flowing in a new channel and a two places where the banks were significantly eroded. After the rain, looking upstream along Three Sisters Creek. Heavy rainfall eroded the creek banks and pulled small trees and shrubs downstream. Three Sisters is on the left. Big Sister shrouded in cloud and mist after Friday’s rainfall. Saturday morning the heavy rainfall warning was still in effect. In fact, we woke up to rain. But shortly after 8 o’clock, the rain turned to snow. The snowflakes clumped together as they fell, forming giant snow feathers! 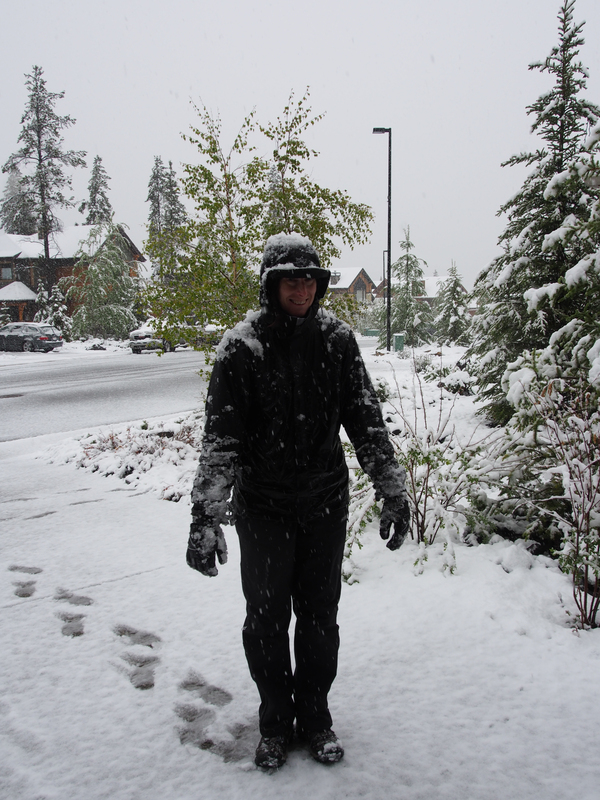 When it was still snowing heavily at about 11 o’clock, Mrs. GeoK managed to persuade Mr. GeoK to don full rain gear and join her for a walk down to the Bow River. 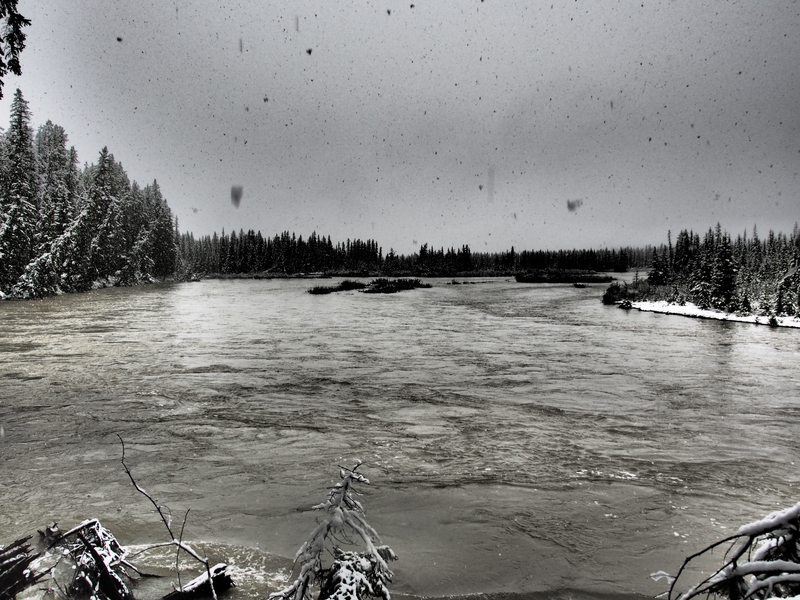 The Bow River is about a meter higher than usual, with about twice the flow. This picture, taken near the Three Sisters Parkway exit at the eastern edge of Canmore, shows an expanse of water about twice as wide as normal. Mantracker Island (which we’ve mentioned in a couple of blog posts earlier this year) is significantly smaller than usual, with all but the centre-most portion under the flood waters. The two fallen trees that served as natural bridges to the island have been washed away. But since more trees are toppling along the river banks, perhaps we’ll get lucky and discover a new access bridge once the water level subsides. Here’s another look at the muddy Bow River as it flows past the Prospect Heights subdivision just east of Canmore townsite. 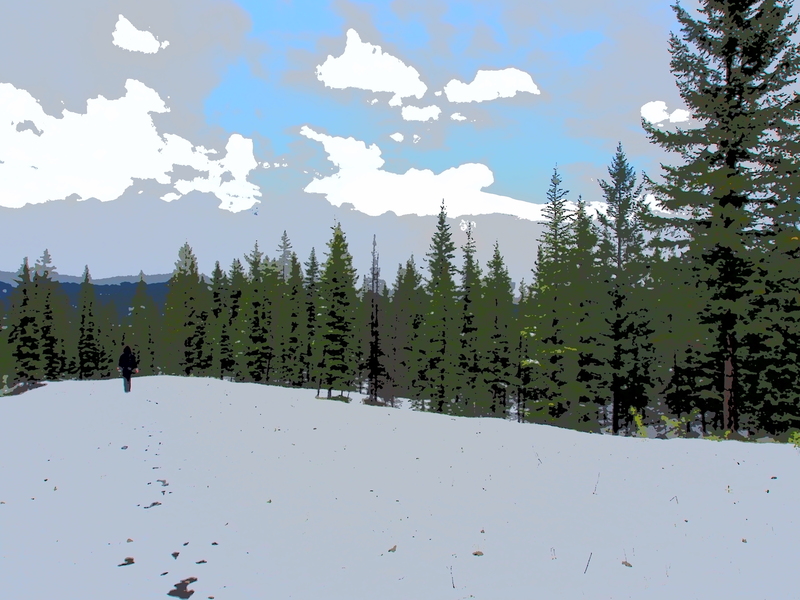 At the end of our walk, we shook the snow out of several aspen trees, in an attempt to keep them from snapping under the heavy snow load on their fresh, green leaves. Mrs. GeoK ended up coated in a layer of heavy snow and looked a bit like a walking snow(wo)man! It finally stopped snowing about 4 o’clock, with somewhere around 5 – 6 cm of snow on the ground. With the sun making a valiant effort to break through the clouds, we headed out to explore further upstream along Three Sisters Creek. We discovered that both of the creek crossings below the old miners’ dam had been washed away by high water flows and that at some point during the extended heavy rainfall, a portion of the dam gave way. 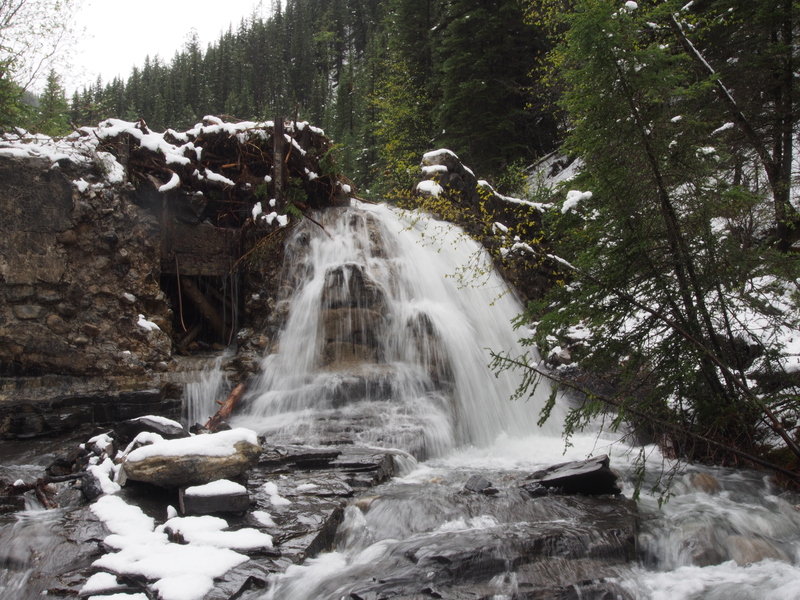 A review of the history of coal mining in the Canmore area suggests the dam was probably built more than one hundred years ago! One end of the old miners’ dam on Three Sisters Creek gave way at some point over the past week. 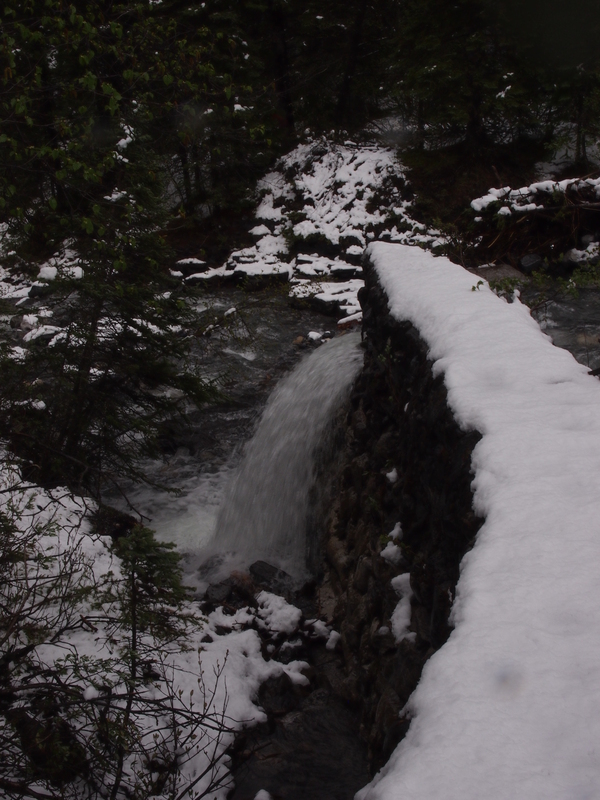 The wall of water that hurtled down the creek bed took out the Highline Trail’s wooden bridge over the creek. Late Saturday afternoon, one of the volunteer trail builders was already hard at work late on repairing the bridge. A view from slightly upstream, showing Three Sisters Creek flowing directly over the breached dam. A view from the top of the dam, showing water spilling out the breached section. We walked north through this snow-covered meadow on our way back home. Grotto Mountain is in the background. Mr. GeoK had his camera turned to the key line art filter. 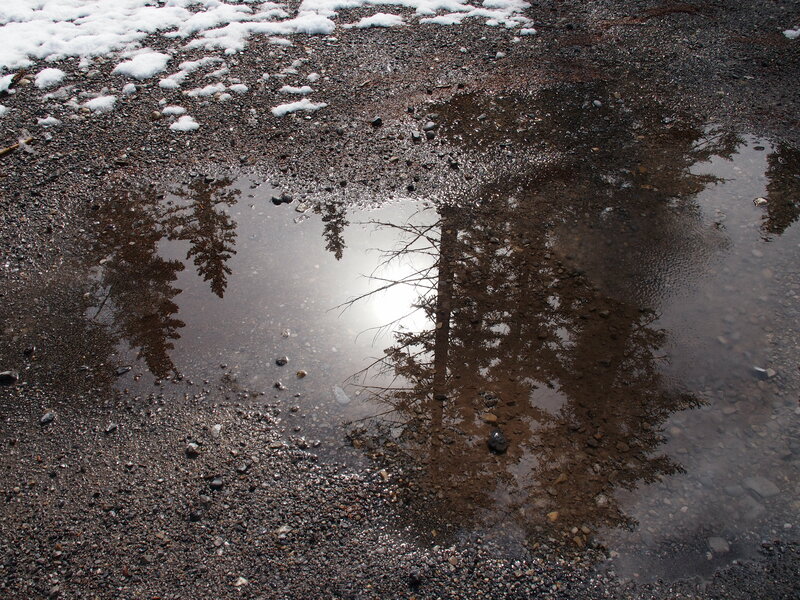 This large puddle reflected the sun and was surrounded by quickly-melting snow…a good representation of the situation in Canmore early Saturday evening. Vegetation pokes through the surface of the Bow River near the Three Sisters Parkway overpass on the TransCanada Highway just east of Canmore. Mount Rundle is in the background. 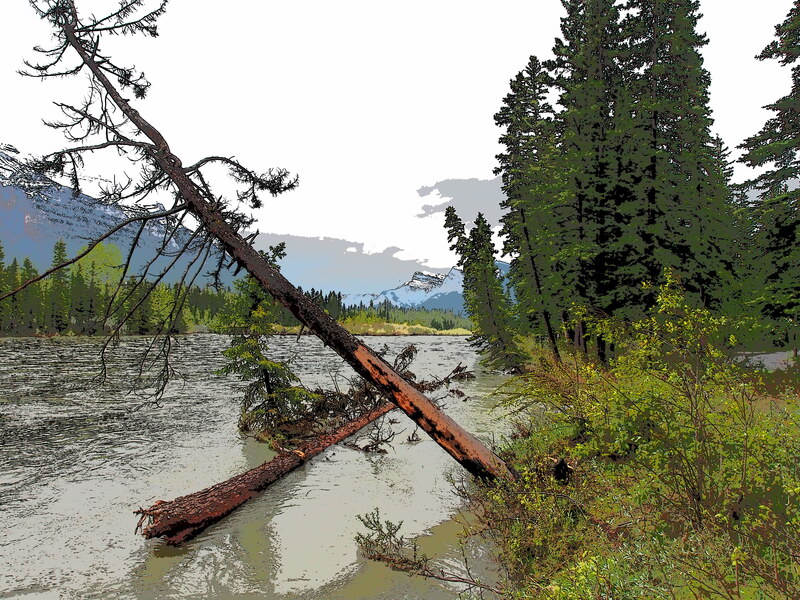 More trees will fall victim to high water levels in the Bow River before the snowpack is all melted. 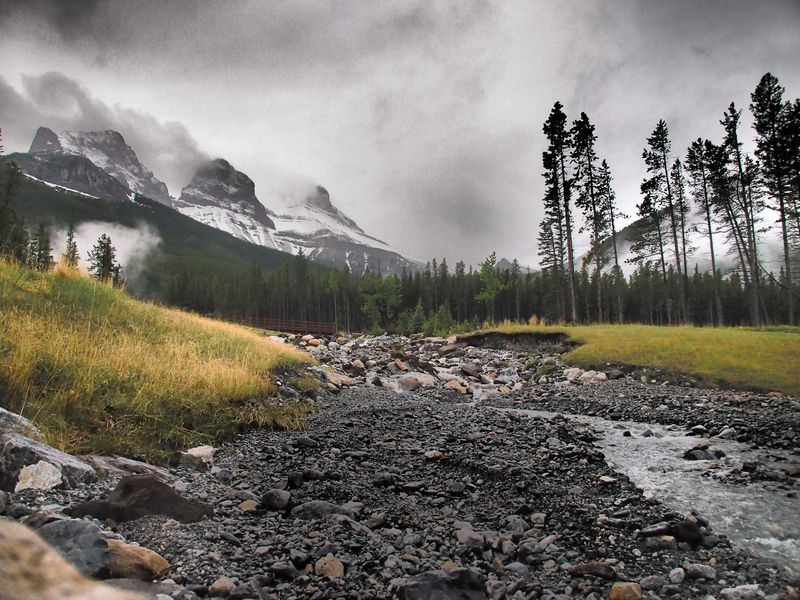 This photo was taken near the Bow River Campground, at the eastern boundary of Canmore. Most of the campground is under seasonal closure, but a half-dozen campsites were occupied as of this morning. As of Sunday evening, the heavy rainfall and flood warnings have been lifted. 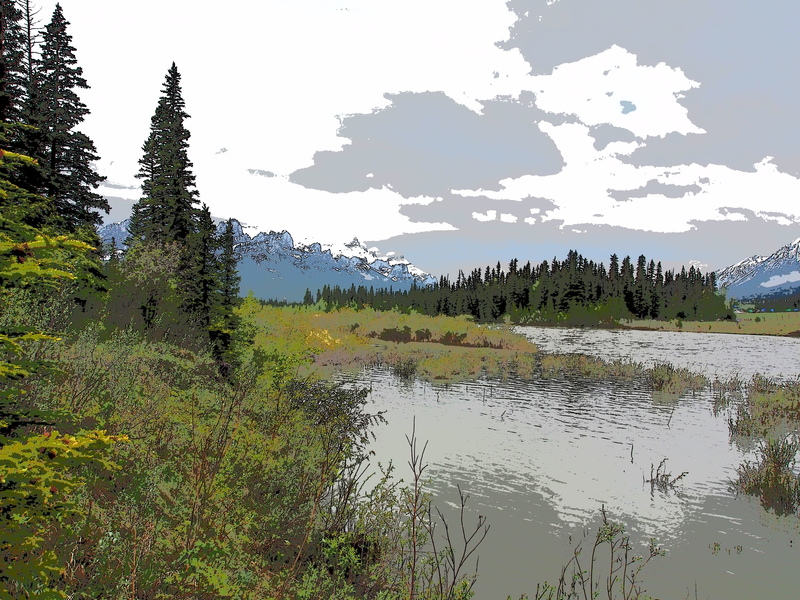 A high stream advisory remains in effect in the Bow River valley, from Banff National Park downstream through Canmore and all the way into Calgary. Boaters are advised to stay off the river, including the new Harvie Passage training area for white-water enthusiasts and athletes. 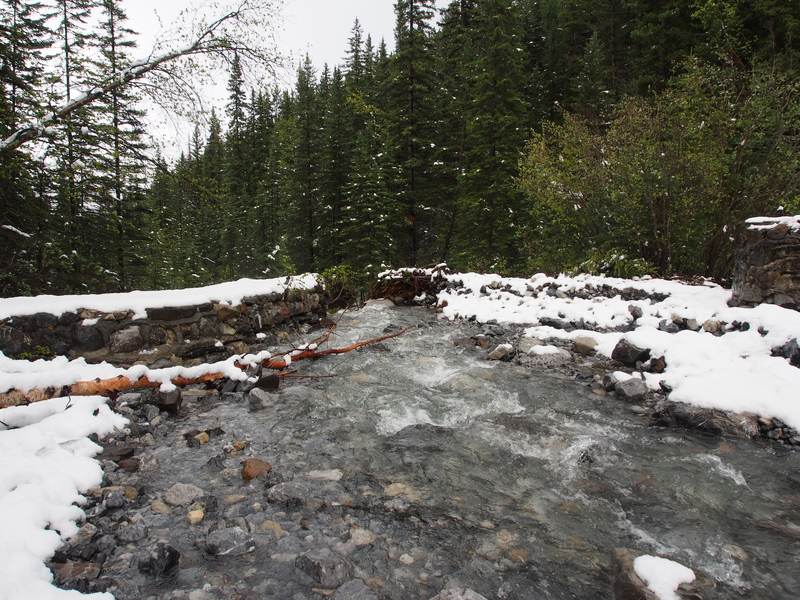 The rainfall over the past week will likely accelerate the melting of the heavy snowpack in the Rockies, which means high flow rates and muddy water will affect sports fishing well into the summer. Meanwhile, Canmore townsite residents are busy pumping water out of their flooded basements, hoping things will dry out soon.